Why is it so hard to make a decent creature feature? It doesnt have to be Alien, but something with a few scares and a cool monster does not seem like it should be extraordinarily difficult. Apparently it is a tall order. Recent attempts have been disappointing. South Koreas Sector 7, which harkens back to 80s flicks like Leviathan and Deep Star Six, is done in by a weak CG monster and dull story. 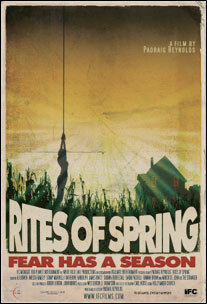 And Rites of Spring, from writer/director Padraig Reynolds, squanders a promising idea while becoming a silly mess. Women have been disappearing from a small town called Hope Springs for more than 20 years. No bodies have ever been recovered. The disappearances always occur at the start of Spring. After drowning their sorrows at a local bar, two young women are kidnapped and brought to a remote location by a crazy old man. Meanwhile, a group of criminals plots and then pulls off the kidnapping of a rich mans daughter. They demand $2 million in cash in two hours or shes dead. They bring the girl to a rundown, abandoned building in the middle of nowhere and wait for the man to bring them the money (despite the fact that earlier he tells his wife that his business is in trouble and $2 million in cash seems like it would be difficult to come by in two hours). Rites of Spring shifts between the two storylines while dropping little hints about the reason for the disappearances. The old man drains blood from the women before sharing it with something locked up underground. He rambles semi-coherently to maintain the mystery about what he is doing and what is beneath the ground. The cutting back and forth makes it hard to build tension and works against the movie. The kidnapping is not very interesting and features annoying bickering and some stiff performances. Its also jarringly different in tone from the other story, so the transitions are awkward. The two storylines fail to mesh into a cohesive whole. When everything eventually converges at the abandoned building, rather than kick it into high gear and unleash the beast, we get 30 or so minutes of rote stalk-and-kill. Some (completely necessary) spoilers follow, so read on at your own risk. The creature, which at this point we have not seen, chases one of the women kidnapped in the beginning to the building. Its tattered clothing makes it resemble the Creeper. It starts killing people one at a time as they attempt to escape from it and the building. Some predictable twists/coincidences are also revealed, including the fact that the rich man fired one of the kidnappers and the same kidnappers knows the woman who fled to the building. I dont know if Reynolds was setting things up for a sequel, but we never actually see the creature. Whatever the hell it is, a psychotic man or a monster or whatever, it is never revealed to the audience. So the last 30 minutes consists of what appears to be a homeless man chasing idiots around an empty building. This is not scary. Other details are vague, such as the origin of the creature and why the blood of women keeps it satisfied. Feeding it has something to do with the crops in the area, but that isnt really explained well either. It feels like ideas were not fully fleshed out before filming commenced. Whatever the reasons for the lack of clarity, a creature feature with no creature sure makes for a frustrating viewing experience.